As a lifelong fan of the seminal Crock-Pot, I’ve only became recently aware of the existence of the Instant Pot, a cooking utensil that is, well, practically instantaneous in cooking its meals. With plenty of multiple, mostly useless, functions including a yogurt maker, a rice steamer and the lazy ability to cook a frozen block of freezer-burned meat in minutes, you can say goodbye to thawing hot dogs in the sink all day. That all sounds fine, mind you, but a few years ago I bought my slow, middling, can’t-cook-from-frozen Crock-Pot from Wal-Mart for $15.00, mostly because it was a display item in an open box, and I still feel like I’ve haven’t squeezed out all my money’s worth yet. I’ve made everything from Choctaw macaroni-stew to tender back-alley pork-ribs, all cooking in a period of 8 or 9 hours, which is so much more my speed; I want to take a nap and wake up to the smell of whatever I’ve got going on in there. It’s heaven. 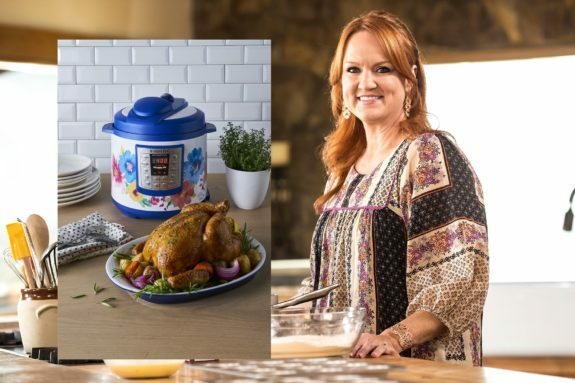 So what makes the Pioneer Woman’s Instant Pot so darn special? Well…it comes in two “vintage” floral designs, so that’s something, right? 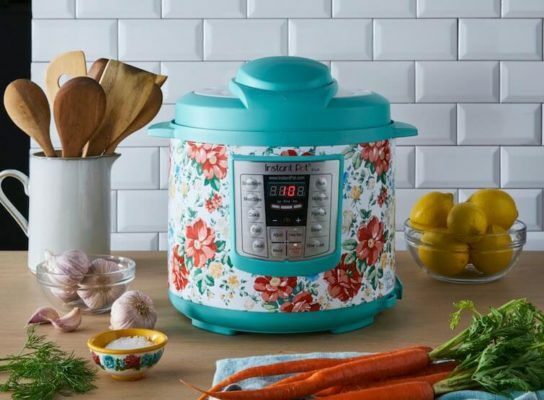 Featuring the same push-button convenience as just about every other Instant Pot on the market, Drummond said that the main reason to get this cooker is to help you cook and peel hard-boiled eggs. Super excited, guys. And as for that “affordable” price-point, get ready to shell out a cool $100 on WalMart.com, as of this writing. Of course, you can get basically the same thing—in gunmetal grey, sadly—for about $60.00 on the same site. But if you think your hard-boiled eggs will taste so much better with the Pioneer Woman’s name all over them, then by all means. It’s your money Ree’s money. Meanwhile, I got a few more years on my dirty ol’ Crock-Pot. Who wants some charro beans and cornbread? I will break wind and.cornbread with you any old time,brother mine. I got one as a gift. It’s pretty cool, but I will never get rid of my trusty old pressure cooker or crockpot. It’s just a pressure cooker you can program, but my old pressure cooker can only fail if the seal gives out. I got it on clearance for $10 at the department store, and was so happy I went back and bought 3 more as gifts. If I had been smart, I would have bought 10. Wow buying that many pressure cookers today would get the FBI swat team on you. Glad it worked out. I’m with you. Coming home from work to the smell of a fully crock-cooked dinner is the best. Every summer it replaces the oven to avoid heating the kitchen. In the winter it’s in use because dark is too late to be cooking. Besides, vintage floral is just a little too trendy. If the pioneer pot lasts five years, it’ll be too late fly to show off. If and when you need to peel eggs with minimal effort: after they are boiled, remove from hot water and place the eggs in ice water for 5-10 minutes.The eggshell will not decrease in size only the interior of the shell will separate. Roll the chilled eggs, gently, with the palm of your hand on a hard surface: Peel-serve-eat. The main purpose with a pot roast is to cook for a longer period of time to tenderize and extract all flavors. If flavor is not important to you use a microwave or a blowtorch. Thank you Rachael Ray. Is your show still on? I’m a cook who can barely boil water. But I can throw stew beef chunks, carrots, potatoes, onions etc in a Crock pot for hours and it never goes wrong. I tried Pop Tarts for breakfast before but set my kitchen cabinets in fire by leaving the toaster on the frozen setting. Pop Tarts are extremely flammable by the way. Google it. I’d like to try something like this but will wait until they are at every garage sale you come across. Some of this stuff seems to end up there eventually. The Instapot is fantastic. I WAS a lifelong crockpot user. This thing is so much more versatile…and the egg thing is just a bonus. My go to option for newbies…take a tray of pork chops, a bag of green beans and new potatoes …add a cup of water and half stick of butter and in 20 minutes you have dinner. And it tastes like the actual food not like the crockpots version if everything tasting the same. I love my Instapot too. Use it all the time-the kalua pork roast is insanely good, can cook after work if I failed to plan-sandwiches for days with the leftovers. Only failure has been spaghetti sauce, which scorched. But everything else has been amazing. my pressure cooker has a safety lock, two blowoff valves, and a rocker. there’s no way it would blow up. that said, i still respect it. i mean, waddya want for $10? Yeah that’s great and all but can I sterilize my magic mushroom medium in it? That’s my top concern for a pressure cooker..
Two of the ugliest designed appliances on the market. My 77 year old mother will love it! Aw, Jeez! More of her sh!t hitting the Market?!? Will the nightmare ever end?? So glad I gave up shopping at W-M years ago so I don’t have to see her ripped off products. What’s with all these posts going on about the pros and cons of crock pots etc. Where are the posts making fun of that waste of time Pioneer Woman and her hordes of “Living the hick life” followers!?! Sadly the Lost Ogle readership seems to be slipping! The person who gets road rage from peeling boiled eggs probably doesn’t deserve a license in the first damn place, much less peeling whilst driving.